Provide feedback to our team to improve your Zentail experience! At Zentail, we take product feedback to heart. Listening to our customers, team members, and prospects is the only way we can create a valuable product as we strive to make ecommerce simple. We use your feedback to better understand pain points in the industry and our product, learn new ideas, and craft useful features. If you take the time to submit your feedback, it means you have a say in how our product develops over time! We want to hear your thoughts, from changing where a button is located on a page to adding a whole new suite of functionality. No idea is too small or too large for us to consider. Ultimately, your feedback allows us to work with you to build the best product we possibly can. This will take you to our ideas board where you can submit your idea and vote on ideas other users have submitted. We read it! The Zentail product team reviews all feedback as it comes in (we're alerted as soon as you submit the feedback!). While we deploy product changes and improvements to Zentail every 2 weeks, we're having a constant conversation about our roadmap. This feedback is used to reevaluate our roadmap and what's planned for the upcoming months. By submitting, voting on, or subscribing to ideas, you can be automtically notified of any updates to this idea. It also let's us know you're interested in that idea so may contact you with additional questions :) You can also view our What's New on Zentail article to learn about our recent, most noteworthy releases. If you reach out directly to our support or customer success teams, they'll be able to look up the ideas for you, but they won't have any additional information or be able to provide an estimate for when your idea will be reviewed. 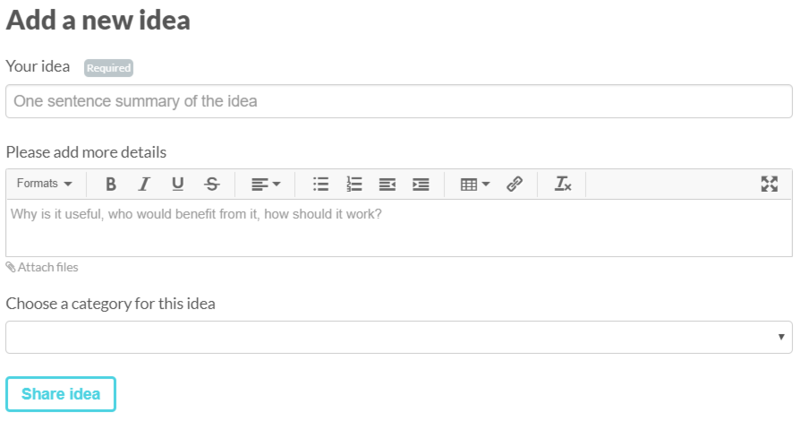 On our ideas board, click the Add a new idea button. From here fill out the title, details, and category and share your idea! Title: A concise, one sentence name for your idea. Details: A description of your idea and the problem or pain point you hope to solve. You can attach files if that will help us understand the problem or the proposed idea. - example: The ability to drag a saved csv from my computer and drop it into Zentail when importing data. It takes me a while to remember what my file is named or where it's saved, so just dragging it in would be easier and save me time. Category: What part of Zentail does this most impact? Realistically, within 2 weeks. Our review process involves a basic assessment of the request and whether it matches any existing, open requests. Roadmapping meetings occur semi-annually although we're continuously researching and reevaluating things. Make sure your ideas are clear and concise to make sure we fully understand what you're looking for. I haven't heard back about my request and I submitted it 6+ months ago. What can I do? Make sure your request is clear. Why do you need this? What is it stopping you from doing? What is the impact of that? Shoot us a message at [email protected] and include the title of your idea and we'll follow up with you directly. How long before my idea is implemented? Once your idea has been reviewed, the status will be your best indication for timing. Under Consideration: The great unknown. We don't fully understand the value this adds, or the demand for this yet. It's on hold until we have more information. Likely to Implement: This is a GOOD idea! If we had unlimited resources, this would be done immediately. Until that day, we have to priortize or projects based on the value they add. The best way to priortize your idea is to vote on it and add detailed comments. - Timing: Unknown, but definitely not in the next 6 weeks. Unlikely to Implement: This idea is outside the scope of our product. - Timing: Not in the foreseeable future. Will not Implement: This idea directly conflicts with existing, important functionality on Zentail. - Timing: Never! Maybe not "never", only siths deal in absolutes. But, practically never. In Planning: We're working out the details. This includes an in depth technical and non-technical scoping of the idea. It's also possible for an idea to from "In Planning" to one of the above stasuses if we discover a techincal complexity. - Timing: 6-18+ weeks before shipped, depending on the scope of the idea. Planned: The idea has officially made it into our roadmap! We generally plan our sprints ~4-8 weeks ahead of time (outside of really major projects). Shipped: Signed, sealed, delivered! This idea has been implemented and is now available. Already Exists: This idea or action is already available. - Timing: No need to wait, it's arleady available!